Go to “Plugins” -> “Add new” and click on “Upload plugin” on the top of the screen. Then just choose the zip file you downloaded in step 1. Once the plugin is uploaded make sure to activate it. That’s it! The calculator is now live. 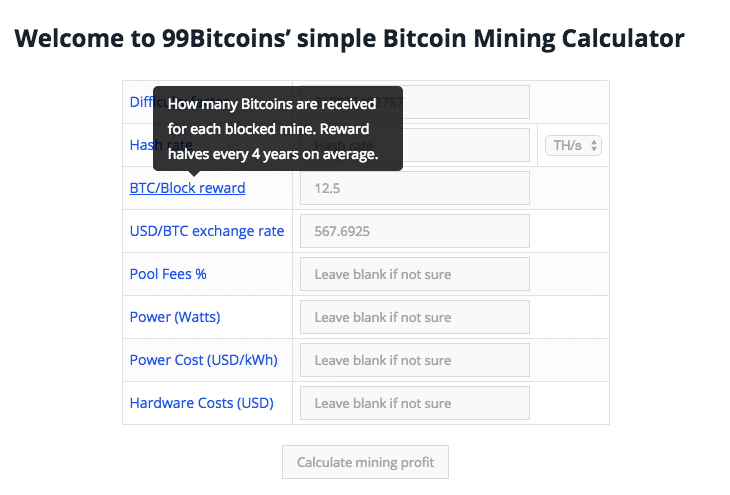 You can remove the credit link to 99Bitcoins at the bottom using the “config” section of the plugin. Both plugins are updated with the latest BTC / ETH prices once every hour. Price are taken from Coindesk’s API and Alpha 61’s API. The difficulty is updated every hour as well and is derived from BitcoinWisdom’s API. If you have any questions about the plugins feel free to leave a comment in the comment section below. If you found these plugins helpful we’d appreciate if you can link to this page from your website and tell your readers about them. Thanks!